The article raises quite a few potential challenges, but the general objective is both noble and plausible. It’s also similar to the argument I made in this post and this post. My point was that urban fruit forests result in low cost, environmentally friendly food for the entire community. That food can be used to mitigate the effects of local hunger and poverty, and/or simply to provide healthy food for those who take it. Provo obviously wouldn’t grow the same kind of food that Seattle is planning, but the city already has enough fruit and nut trees — as well as people who gleen from them — to suggest that this could work. Close up of a young Gala apple tree in the Joaquin neighborhood. I’ve written several times on this blog about the possibility of using public space to grow edible produce, specifically fruit. I think this is a wonderful idea, but I get the sense that some people see it as prohibitively impractical or some sort of pipe dream. But as this article demonstrates, urban food production is very possible. The article details the plans to create an edible forest in Seattle. 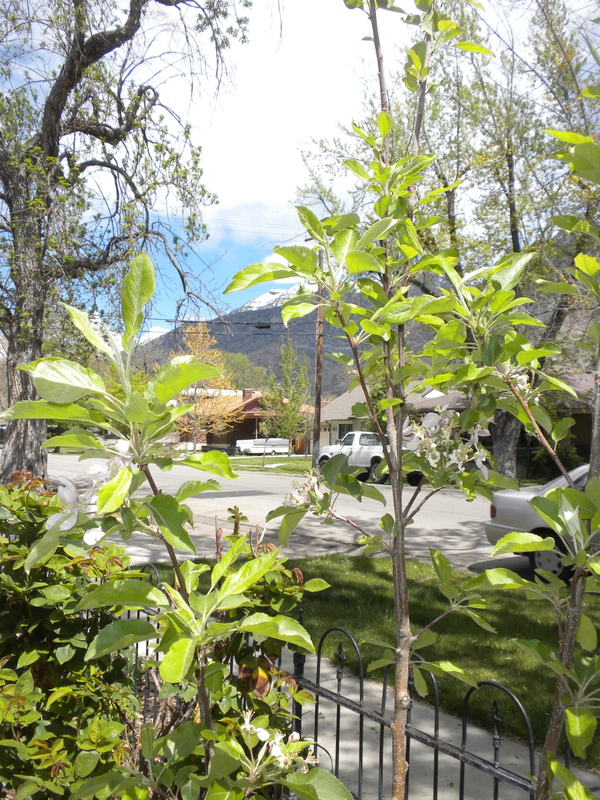 Though Provo is a very different city, the already-abundant fruit trees — as well as the increasing local interest in gleening — suggests that something similar could work in Provo. Here’s a fun little piece on people in San Fransisco who are literally grafting the branches of fruit trees onto non-fruit bearing trunks around their city. For the record, I’m not in favor of this idea in Provo, in large part because Provo’s size seems to lend itself better to working within legal channels. But the point the “guerrilla grafters” are making is that urban fruit production can be a major asset to a city. It’s a very similar argument I made here, when I speculated that with Provo’s high rate of volunteerism and already-abundant urban crop the city could become a leader in this movement. In Provo, the aroma of autumn hangs in the air, the scent of ripening apples lingers in the streets. 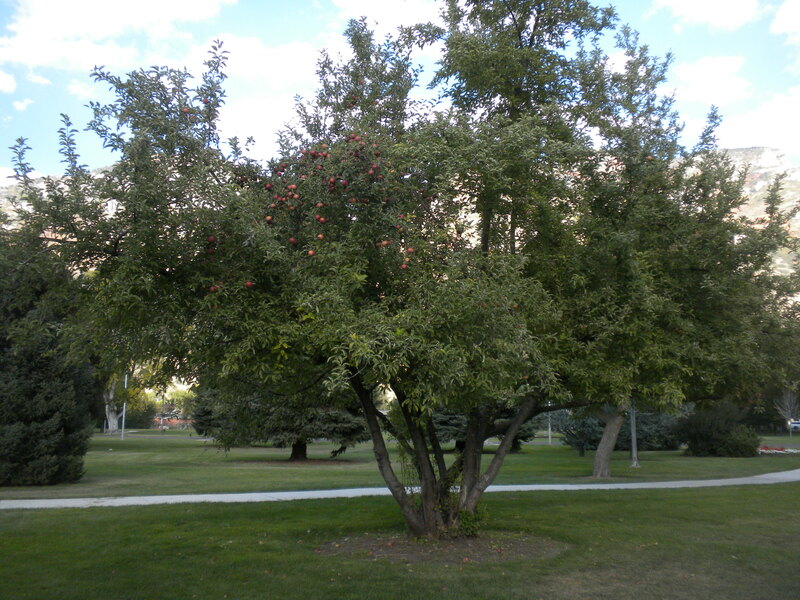 Several years ago, Laura and I noticed Provo’s many neglected apple trees — and the fruit they leave rotting on the ground — and began gleaning them. 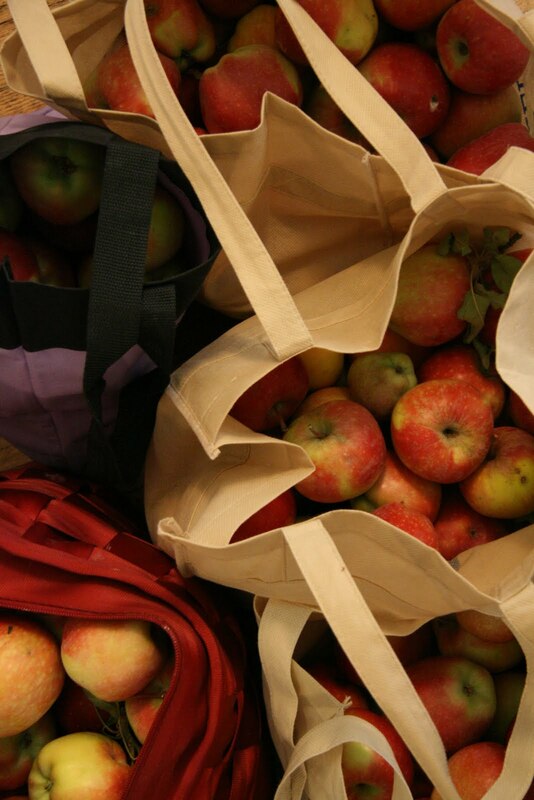 The activity has become something of an annual tradition for us, and in the past few years we’ve made dozens and dozens of pies, loaves of apple bread, bottles of apple sauce and other delicious food with the apples. This year, however, competition was more fierce. There are several trees we like to visit, but each time we went there were several other people — usually couples — gleaning the trees as well. Though my initial reaction was to be competitive, seeing other people gleaning turned out to be fairly pleasant. While enjoying the cool autumn air and the sweet smell of fruit, we got to meet other people who also felt like it was a shame to let pounds and pounds of apples go to waste. Plus, for the first time ever, we borrowed a telescoping apple picking tool, which allowed us to pick the highest apples and bring in the biggest harvest ever. We literally picked hundreds of dollars of free apples. Gleening urban fruit is fun and has a positive impact on the community. It prevents trees from making a mess, thereby saving on grounds keeping costs, provides inexpensive (free) healthy food to residents, and can actually be a form of exercise. And at least as long as it remains a niche activity, there is a sense of camaraderie among gleaners; it’s as though we’re all in on a really cool secret. In many places, gleaning is also becoming a way for cities to provide for less fortunate people. Volunteers go out and pick the fruit, and then some or all of it — depending on the particular program — is donated to local food banks and homeless shelters. It’s a win-win, and if it works properly there are almost no disadvantages. Wouldn’t it be great if that happened in Provo? Even better, wouldn’t it be great if Provo became a leader in urban farming, gleaning, and food production? There are many people in Provo who don’t have the money to buy enough healthy food, and gleaning could become a boon for them. More selfishly, the more edible produce we grow in our community, the more delicious food we eat. Making Provo a leader in urban food production would be comparatively easy. While it will ultimately take millions of dollars and many years to revitalize downtown, an apple tree costs only about $30. Every homeowner could afford to plant a single fruit tree. (When I moved into my home recently, Laura and I planted five.) The city also could easily plant more fruit trees in parks. We could rapidly increase the amount of food our public spaces produce, all for a very small cost. Of course, there are challenges. One of the main concerns people have with fruit trees is the mess they make. That’s a real concern, but significantly, this year I noticed that there wasn’t much of a mess around the trees we visited. Enough people gleaned them that there were barely any apples on the ground. Problem solved. In other words, the demand already exists to consume all of Provo’s apples. With more awareness and organization, Provo residents could easily glean and clean up after hundreds of additional fruit trees. To realistically make Provo an urban fruit mecca, the city (or another organization, if it was interested) could organize volunteers to periodically pick the fruit. Volunteers could keep some of it, and donate what they can’t use. I don’t want to get into the nitty gritty details here, but we could call this organization the Provo Gleaning Committee, or something to that effect. Provo is the best place in the county for volunteerism, so finding interested people shouldn’t be very difficult. So while none of this would be free, the investment would be low and the pay off fast. It could probably be done all with donations; I know I’d contribute a fruit tree to plant in a park, and I bet others would as well. In the end, the health and community benefits would last for generations, and Provo would enjoy the collateral benefit of having a reputation as a leader in this growing movement. 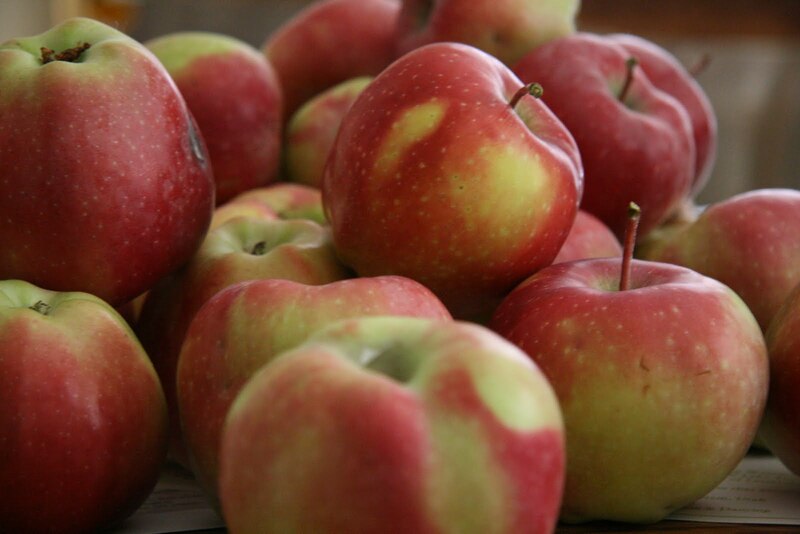 To read about my first experiences gleaning apples in Provo, click here, here and here. I thought I’d end the “Picking Apples” posts with Part 3, but I figured I’d post a few pictures. All of these pictures are of apples we picked from the second tree (see “Part 1“). Also, there are a bunch that wouldn’t fit in bags, so I never really got a good picture of all the apples together. These pictures probably represent between 1/3 and 1/2 of all the apples we’ve picked.